Meet the hottest firms in the field. The rich are getting richer when it comes to publicly traded biotechnology companies, judging by their ballooning market capitalization. It’s a product of the current Wall Street surge—some call it a bubble—that continued in the first half of 2013, with 52 companies going public and the overall market closing at record highs. Following is a list of 25 biotechnology companies, ranked by their market cap as of July 24 as furnished by the exchanges on which they trade their shares, or by other publicly available sources, such as any of several free stock information websites. Figures of non-U.S. companies were converted to U.S. dollars from various currencies. 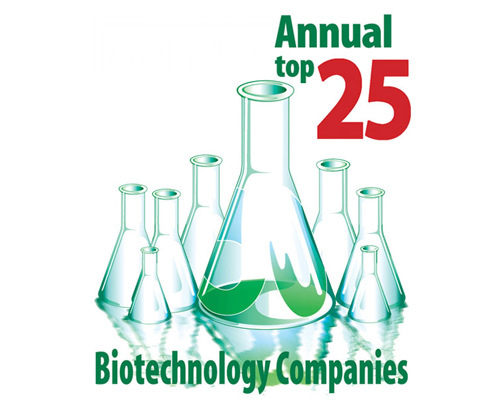 Several biotech giants sit atop this year’s list, as they did in GEN's Top 25 list of July 2013, and again in January 2014. This latest list, however, includes several new arrivals, namely biotechs that grew their way to the top 25 through mergers and acquisitions (M&A). These include Valeant Pharmaceutical International, Actavis, and Endo International. Another big difference from the January list: The minimum market cap of GEN Top-25 biotech companies this time around is just under $8 billion, nearly double the $4.5 billion minimum of companies on the January 2014 list, which was nearly double from July 2013. This year’s list also includes three biotechs from Asia—India’s Sun Pharmaceutical Industries and Dr. Reddy’s Laboratories, as well as China’s Sinopharm Group, which includes biopharma among 10 core life sciences and healthcare businesses. Also on the list are five venerable European biotechs, a category that does not include U.S. companies that redomiciled in Ireland or the U.K. over the past two years through tax inversion deals. 1 On July 18, AbbVie announced that it would proceed with plans to acquire Shire for roughly £32 billion (approximately $54.3 billion) in cash and stock. The Abbott Laboratories spinout and the biotech giant plan to combine into a new company domiciled in the U.K.—entitling it to a 13% tax rate rather than its current 22%. Shire already maintains executive offices in Basingstroke, U.K., though the company is formally headquartered in Dublin, Ireland.